This morning Israel’s tabloid YNet posted an article on how Lieberman (again) is investing in the digital warfare to polish up the PR for Israel, sustain the myths, and beware Israel from implosion of the aircastle it build carefully in the past 63 years in which technology and social networking was not that developed. Stating with the sideline “Battle for September” Lieberman pulled out the wallet and threw another bold 10 Million shekels on the table to instruct Israeli diplomats HOW-TO-TWEET! Hence, we understand times change and Social Media too, the web is working increasingly against Israel. Is speeding up and so are we. Facts that have been hidden for the eye now get visible in a second and demolishes Israel’s image and hasbara faster than it can be invented in the first place. Observing the possibilty of an exhausted Palestine calling on UN for statehood, on May 25 of this year, Israel Foreign Ministry bracing for a flood of pro-Palestinian tweets ahead of the UN session on a Palestinian state already published an article in Ha’aretz (or as wel call it Hasbara3retz) Israel was preparing itself for Twitter war over Palestinian state! 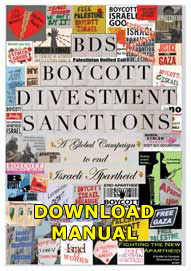 Unfortunately for Israel, the Flotilla was trying to come over to Gaza, and on June 20, 2011 GIYUS quickly changed it’s “target” from general hasbara into a real pointed target by publishing openly a hitlist to target the peaceful human rights sailers (online) As you can see at the hitlist and the previous link to the whole appeal of GIYUS, there we’re even buttons added for quick access to the data of the so called flotilla-dangers. Well buttons, links. For it seems the webdevelopment department of GIYUS fell short on budget to create some real buttons or they just lack that knowledge too. Forget just all details, hasbara is so funneled up in minds of the users, that they cannot comprehend more than pushing a button. So the Megaphone and buttons disguised as plain html-links will do for them. Which makes it easy for when not being paid you do not want to loose much time in saving Israel for the love is mainly as longlasting as the shekel reaches. Israel’s spam propaganda machine has targeted many online activists before us in a way that even wikipedia even has an entry about it. Megaphone desktop tool From Wikipedia, the free encyclopedia (we don’t guarantee the content for it is known that even wikipedia is no reliable source (for a long time…. ) so GIYUS ensures that even at wikipedia you do not get truth but only Israel’s version/vision of reality, the Eretz also finances training courses on Wikipedia editing. Changin history for the sake of Hasbara. So how does GIYUS work? Well mainly the one -button-policy consist out of reporting. Reporting all those who not comply with the zionist ideology, determine them as anti-semetic and thus forming a threat to the Eretz. 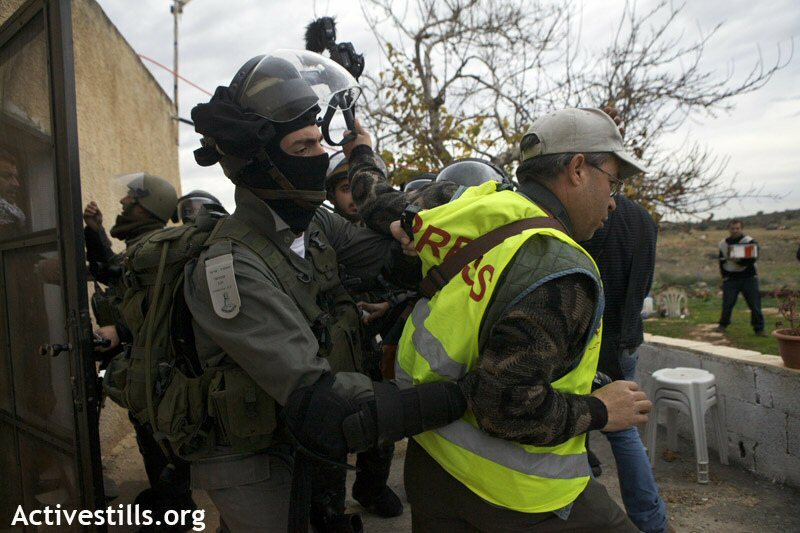 Anti-Zionism is NOT Anti-Semitism, but the recruits are drilled to act on command. Push the buttons. 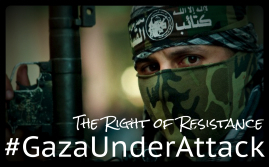 This way you, as a normal common sense person, retweeting, or reposting a pro-palestine link get’s suspended at Facebook, Twitter, censored at Reddit or where ever on the WWW where social activism takes place. A very “grateful” platform for GIYUS on which they endulge themselves in reporting anything they do not like or which poses an imaginary threat to the existance of Israel, the GIYUS and birthright-recruits go berserq in abusing the report-button reporting your posts as spam untill it is deleted . 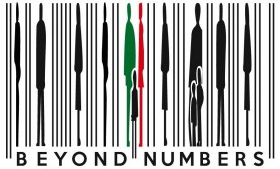 Like the Oneworld song: “Freedom for Palestine“. A song that threatens the existance of Israel. Really. They stopped the song from spreading, but they can’t stop us from singing. We love the song! It gives a great beat to blog on! As is pointed out here by this common sense user of Facebook in a reaction in a thread about the OneWorld song, on the page of “Stand with Israel”: “The button is for ABUSE not for childish games”. Childish indeed but hence, we take it as a badge for as soon as GIYUS starts targeting, you know you are on the path of truth. They don’t like truth, nor facts. Engaging in that makes no sense either, for where no braincells are working, you can push buttons as much as you like it will not activate their common sense as in NEVER.They only try to buy time so you won’t post another link or message of truth which exposes their lies. Many activists or Pro-Palestinian users of Facebook got suspended or saw their page totally vanished from the Machson bli Paneem (Book without Face), great names too, like footballstar Marcelo Vieira da Silva Júnior, Ismael Haniyeh, UrukNet and more where removed from the Online Checkpoint. This is only a temporary incovenience which can be overcome by creating a new one and just post on like you used to do. Eden Abergil did the same. Eden, one of the real “tough” ones of Tzahal, was removed by Facebook after the army (as usual) quickly hit the alert button, probably called Mark Zuckerberg Red Phone and ordered to remove the profile, for she was posting pictures of humiliating Palestinians. But Eden came back! If Eden can do it you can do it! In this video is explained how Israel manipulates the US Media so Israel makes sure, even if something gets into ears of mainstream media or journos, it is not being broadcasted or published. You are kept “ignorant”! Today Aug 29, 2011, Jerusalem Post fired Larry Derfner! Since 600BC (The Athens’ Democratic Ideology of Free Speech) civilization talks about Free speech, “The State of Israel” killed it on monday evening on July 11, 2011 by a vote of 47 to 38 for a new anit-boycott law killing merely every form of free speech. IOA set back history to midievel ages, I suppose it will not take too long before we will have a hebrew version of the Index Expurgatorius for Pro-Paletinians books or Pro-Palestinian journalism, and as it seems Larry Defner is the first victim. The “State of Israel calling itself a Democracy, banning free speech about the conflict or any criticizm about occupation from the outside, also “in house” censores the critical voices while Free Speech is a basic and necessary condition for any freepolitical of moral debate. Welcome to “Israel”: The first and sole “democracy” in the world which is not only besieging Palestine and it’s complete population & since July 11, 2011 legally controlling and besieging also the minds of it’s entire own people. Israel’s greatest fear is Truth. Those who tell so or can convey in word, images or film are attacked, ransacked, equipment confiscated, targeted violent, shot at, gassed, detained and forced to collaborate and more. Read all documented attacks on press on this blog here. The crackdown of press is beyond every imagination. 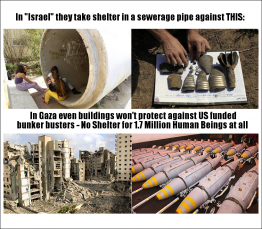 This fact should wake people up on itself, why Israel is so afraid of documenting it’s crimes for they have been able to prevent this reality for too long. Time’s are changing and current technology enables us to share real time events which is suppressed by all means. Women press anchors get live attacked with tear gas, photographers filmed while shot at, and all is done to prevent them even from entering the territories. 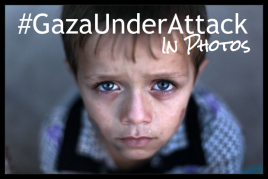 This is why all Palestine needs your help to share news and footage, to get it OUT of there. But the real laugh of the century we had, when an Israeli soldier was caught live hijacking @Abou_Charlie ‘s Phone To Send Out Lies. Abou Charlie is an eloquent English speaking tweep, so his short failing of decent grammar tweets worked suspicious right away. After this Abou Charlie got loads of new followers which not are lucky to get trustworthy and hasbara free newsupdates & analysis about Palestine’s events. Which proof again, all action of IOA to hide the truth work couterproductive. If the Pope does so, Israel can’t stay behind of course. 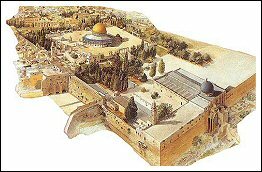 For Christians are also inconvenient in the Lebensraum of Zion. 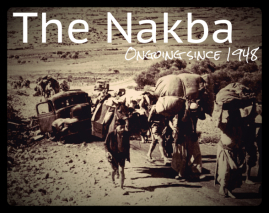 100.000 have been expelled during the Nakba and enduring the occupation as well. 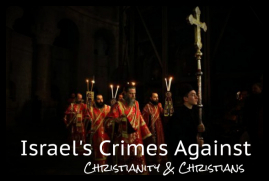 For like many kept ignorant don’t know, Palestinians come in many kinds, also Christian ones. And they are all brother but also all goyim. And for the Pope had some critics on Israel’s policies towards Palestinians (Christians as well as Muslim) they do not spare the wholy man again in criticizing him or just leave it to imagination with hasbara again to cast some doubt and feed intolerance. No dear readers, this is no typo. No need to email me. Israel hit the Beck Button, the Glenn Beck Button. For salvation of the nations hasbara it even cuddle’s up witj Christian Zionists of the worst kind who do not love the books of Abraham, Mozes and Isaaq, but just a profiteering and prophetizing about the Rapture if the Pay-Button is not hit quickly enough. Just forget about the Jewishness of the “State of Israel”, there is no Judaism in Zionism. Not only in Israel, but also considered terrorist organizations by Canada, the European Union and the United States. See, for example, item 20 of the State Department’s current list of designated foreign terrorist 0rganizations. For sure Beck, a self appointed expert on terrorism and the new world order, will explain this as part of his field work. Be sure not to miss Ami Kaufman’s report from the historic event! To Restore the Courage Glenn held a speech near the Temple Mount and the reaction of Feiglin was: “Jews like it when goyim finally smile at them, but sometimes a smile is more dangerous than a scowl, and this is one of those occasions,” for Feiglin noted that Beck was purposely holding his event close to the site where, according to the New Testament, Jesus overturned the tables of the moneychangers where Jews on pilgrimage to Jerusalem redeemed funds for sacrifices that would be made in the Temple. He said this was problematic, because the incident has been a source for anti-Semitism for centuries. “This created the image of Jews as pursuers of money and Christian anti-Semitism that led to rivers of Jewish blood,” according to Feiglin. So they hit the Mute Button, and send Glenn Beck Back so he could push the call the stewardess button in the airplane. It is obvious, the State of Israel, owning almost 90% of world’s media, has a great problem with all those who it is not able to control namely the free thinking people which can not be paid for funneling up nor accepting propaganda and all those looking for the truth. For there are more and more humans with common sense whose veils of ignorance are falling. The blanket of hasbara which disguised the ugle crimes of Zionism are withdrawn and the Internet seems to be the most damaging thing for “The State of Israel’s” existance. Israel is not able to control this. So it tries to manipulate it. Now, by sending it’s ambassadors and representatives to Hasbara-Class. And if this does not work out, kill witches will do the job to keep the ugly truth out of your eyes. On August 9, 2011 Israel pushed the kill switch on Gaza. As hasbara wants to make us believe, the initial denying reports on Aug 10th, 2011 in which Israels Occupying forces claimed they had nothing to do with it. 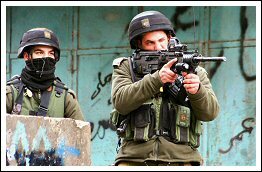 Where on the evening itself, also via the internet reports came in from Palestinians in Gaza witnessing bulldozers at work. We don’t buy that neither for Jawwal’s cable lies at a depth of 20 meter. Knowing hasbara’s system, it is just a matter of time untill some media, mostly in the US comes with the “explanation” . This time from Aaron Klein, well known for his great imagination and phantasy, well paid by the Zionist lobby at WND: Israel’s armed forces prevented a major terror attack and for this it had to cut the lines. 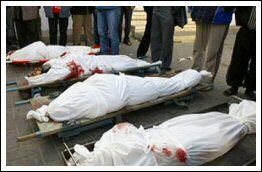 Regarding the previous attempts of other governments in revolting countries where the killswitch was applied after the successful #Jan25 Egypt communication, we like to remember you that also in Egypt, many people died because of the lack of communication. People we’re bleeding to death while no possibility to call an ambulance. Many have lost their lives this way. Many in Gaza believe this blackout on Aug 9, 2011 was just a rehearsel for a major blackout during another operation on Gaza. For by any means, coverage of the almost daily bombings, shellings and violence are increasingly being censored from media, coverage, journalists or alternative or mainstream media denied, harrassed or even jailed. Water needs treatment as well. 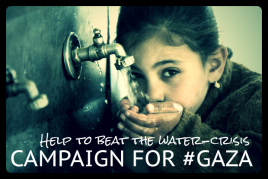 Almost 90% of Gaza’s drinking water is polluted and unfit for consumption causing many water born diseases. Without electricity this plant neither can work. So, causing deaths as well. 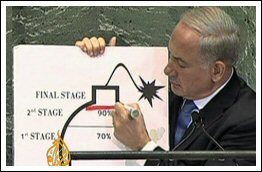 In the past “State of Israel” also pushed a button so the dam preventing Gaza from being flooded, opened, and flooded it by purpose. Damaging more, of the already during Operation Cast Lead damaged 60.000 houses, killing live stock and ruin that which was left to the people of Gaza and even killed people. Directly and indirectly, for without power or with floods, denial of repairs, no sewerage is available which worsens the health threats caused by water pollution or lack of drainage. Communication is a human need and became a Human Right for Art 19 of the ICCPR which is part of the International Bill of Human Rights. Human Rights are universal. For all humans. There is only one race: The Human Race. Article 19 of the ICCPR states that “Everyone shall have the right to freedom of expression; this right shall include freedom to seek, receive and impart information and ideas of all kinds, regardless of frontiers, either orally, in writing or in print, in the form of art, or through any other media of (their) choice.” This right requires that all governments meet their responsibility to ensure that no one is silenced or excluded simply because they lack access to communication technology or is deprived of information or communication also for the purpose of social, moral and healthconditions. Nader Elkhuzundar explained in an interview with Electronic Intifada that the people feared a blackout would coincide with an Israeli attack on the captive population of Gaza, and without any connection to the outside world, totally locked down and closed in, with no place to go, neither the people outside Gaza nor those inside could really know what was happening not any coverage of any crisis would be able to exit the Gaza Strip. Forget all details. 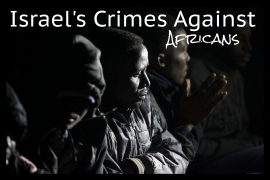 For it is all and only about ethnic cleansing. Israel is not looking for peace nor talks about peace. It is looking for this: The Greater Israel. 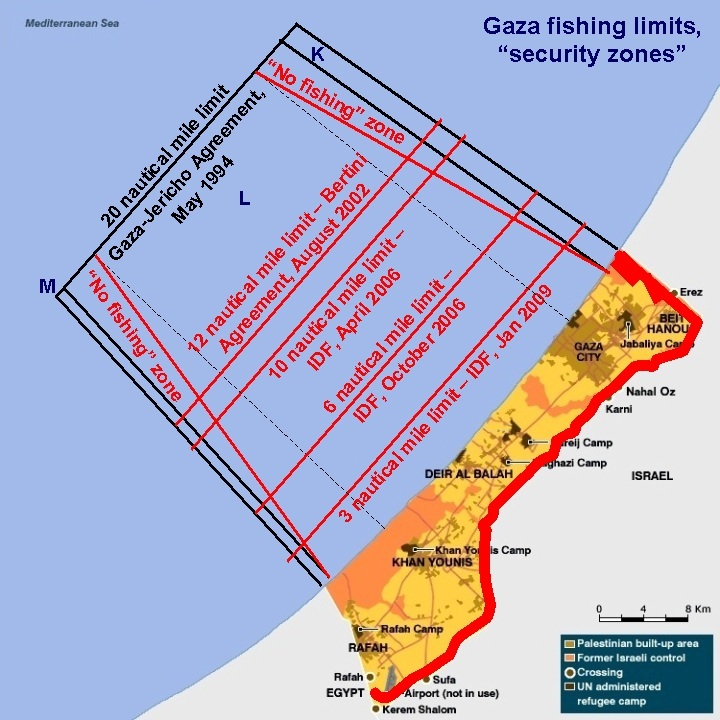 On Aug 30, 2010 long before peace talks Netanyahu vowed to make no concessions, and confirmed the final goal reiterating the Eretz Israel stretches from the Mediteranean Sea to the River Jordan. This complies with the Map of the Greater Israel as issued by a Radical Zionist Settler Movement. In the proces of achieving the “Greater Israel” Zionism has been succesful in all silence and ignorance of the world, in committing over 77 massacres to establish the “Jewish Nation” leaving the Palestinians in the West Bank only 22% of the land of the historical Palestine. 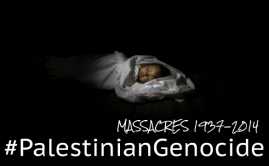 It did not stop there, for an ongoing massacre is going on every day. Today, 173 people have been killed in 2011 so far. And we haven’t even reached the end of the year. 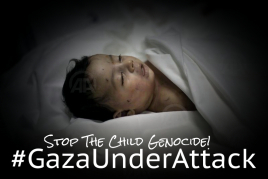 During a recent operation on Gaza, starting Aug 18, 2011 again another Slaughter in Gaza was committed amid World Silence. Yet no comments from Western governments. And here you will find the images you did not see in your local media or news. 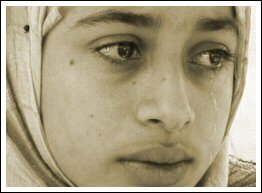 Neither the atrocities committed by the “State of Israel” during Operation Cast Lead, the previous massacre on Gaza in December 2008 till January 2009 in which over 1400 people, mostly women, elderly and children lost their lives. If no buttons are pushed, directly or remote like in the picture aside an Israeli Soldier operating a drone from behind a computer – Israel’s Game Style Remote killing technology– , the zionist entity harrasses the people of Gaza with mock-attacks, in West Bank with sound or tear gas bombs, the last caused immediately the 1st day of this year the death of Jawaher Abu Rahma and after her killed 172 other Palestinians. In any way, by any means possible: Ethnic cleansing hidden, censored, or silenced by force for the world, disguised as archeology or by propaganda. The “State of Israel” itself declared a Web War and called it’s “recruits” to duty. That was enough, for those immune to hasbara, with a common healthy sense and intelligence to judge of our own, immune to insults of our braincapacities to be triggered. We engage. We will not remain silent and the voices for truth become louder. 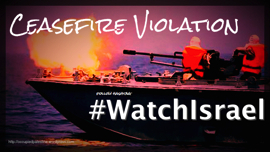 ► No US sponsored tear gas works here, we have Firewall in stead of an Apartheid Wall…. ► No oppression can stop us, we are many and API is our weaponry…. ► No matter you state, we will multiply the truth faster than your hasbara can travel on the WWW…. In social justice protests in Israel called #j14, the people of “Israel” call for Social Justice, forgetting about the equal rights for the neighbours or even those of Palestinian origin inside “Israel” Also to them we want to send this wake-up call. Your government is wasting money, your taxmoney to learn how to spread lies or polish up the ugly truth to an acceptable PR level, which is not exactly the mission of a diplomat. We already witness your expensive Danny Ayalon spending many many hours on twitter answering ridiculous questions, with no facts at all. 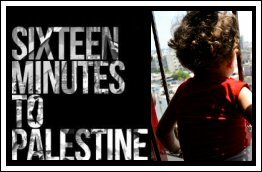 Maybe #j14, should consider also the cost of this project again, for as the whole occupation, suppression, oppression, annihilation and lies never will work out in the end, but are the main and sole reason, your “government” let’s you suffer for the costs, now again for another 10 million NIS. The pushing of buttons in every way has cost already countless lives, and now even is announced the government will not fund livesustaining medical aid for Sharon, may it be clear your lives do not worry Zionism at all. For if Sharon’s button will be pushed. Who do you think you are when you get that far? Hasbara is dying. Face it. Dangerous social media games – When a state must pay citizens to fight its online public relations wars, it has already lost. 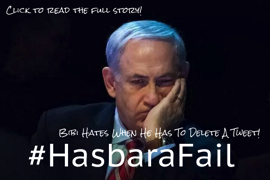 Below more information & resources on how to deal with hasbara : Get Facts! Forget all details! It’s just about this! 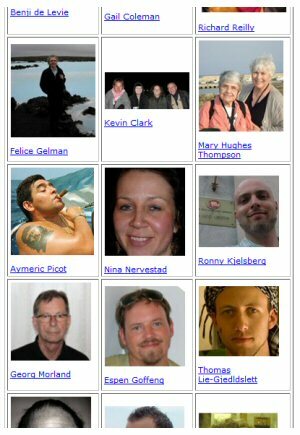 Testimonies | Breaking the Silence | New Database online ! Don’t think it’s about “Arabs” or “Islam”… we are all Goyim! …will be updated of course with related news or relevant counter “cyber truth ammo”. 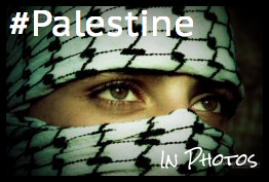 Stay Human, stay safe and Free Palestine! Activists Resources | Knowledge is Power!